With spring arriving soon, many homeowners are feeling excited about planting new flowers and shrubs. But as you begin to plan your spring gardening projects, don’t forget to care for the plants you already have. While trees typically aren’t too needy, there are a few brief steps you should take to protect their health as seasons change. Inspect your trees. Generally speaking, we don’t have the sort of weather here in Southern California, that typically leads to declining tree health over the winter. But spring is a good time to check your trees regardless. Observe things like limbs that seem frail, signs of fungus or rot, trees that are leaning, or those that have grown too close to the house or other structures. Perform necessary tree trimming. 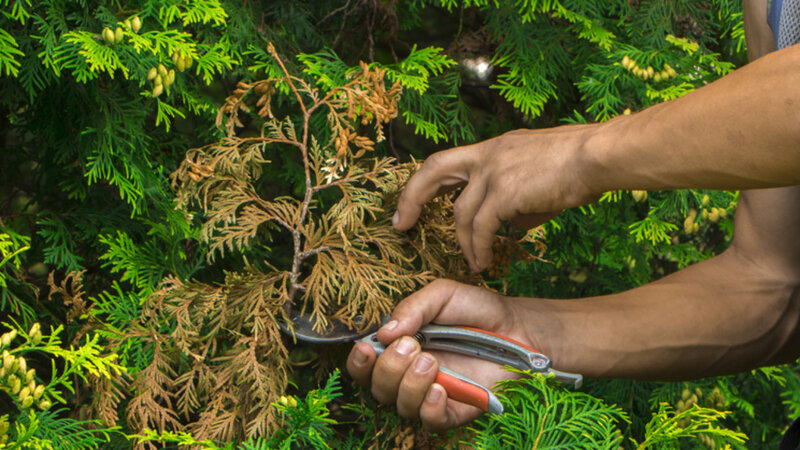 Pruning should usually be performed in the dormant season (winter) for healthiest results. However, damaged limbs can be removed now. Spring is also an excellent time to observe your trees for signs of aging or disease, because those limbs won’t produce leaf buds. Dead or dying areas can be pruned back. Mulch your trees. As spring arrives, hot weather won’t be far off. Mulching around the bottoms of your trees can help to preserve soil temperature and retain moisture, protecting each one during hot weather. Mulch also mimics the nutritional substance your trees would gain naturally in the forest, from organic substances that would normally accumulate on the soil around the bottoms of each trunk. Fertilize. Spring will bring your trees’ growing season, as they leaf out and (in some species) produce flowers and fruit. They need energy for these activities, which you can provide via the right fertilizer. Plus, healthy trees resist disease and pests much more readily. Choose a slow-release fertilizer that will feed them all season. If you have questions about caring for your trees as spring arrives, please give us a call. And remember, if you do choose to engage in any tree trimming, safety is of utmost importance. We can perform that for you, or remove any trees that have grown too close to your house, porch, garage, or other structures.